There are some things that you just can't anticipate. I didn't want to move abroad and I never thought I would, but here I am, in Switzerland of all places, and I'm happy. I never thought I'd eat salami and parmesan cheese for lunch, but I just did. And I never thought I'd have a blog, let alone a food blog, but nine months ago I clicked 'publish post' for the first time and today I'm posting the 100th post. This is it, #100. Have you been here since post #1, way back when I wasn't even sure what haus would turn in to (although I still don't really know)? If so thank you! While I'm on the topic of the unexpected, I never expected to be baking so much bread. Fresh bread is everywhere in Zürich and there is little need for me to make my own, except that it is just so satisfying to eat bread baked in your oven. This is Betty's Bread. 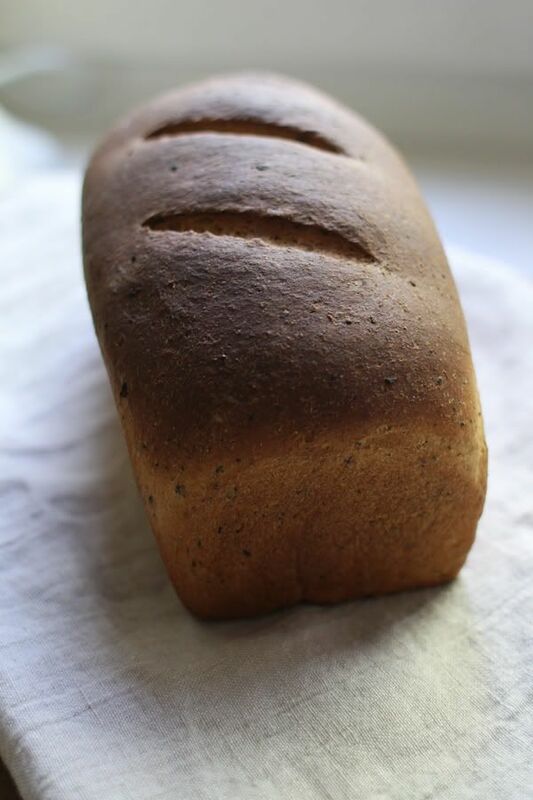 When I was lounging by the pool in Tuscany (siiigh) with my friend Katie and her mom Betty, and Betty heard that I was doing a lot of baking she mentioned that her go-to recipe is a Honey Whole Wheat loaf. She sent me the recipe, and while the addition of cottage cheese threw me for a loop, I went ahead and baked it and let me tell you, it's delicious. 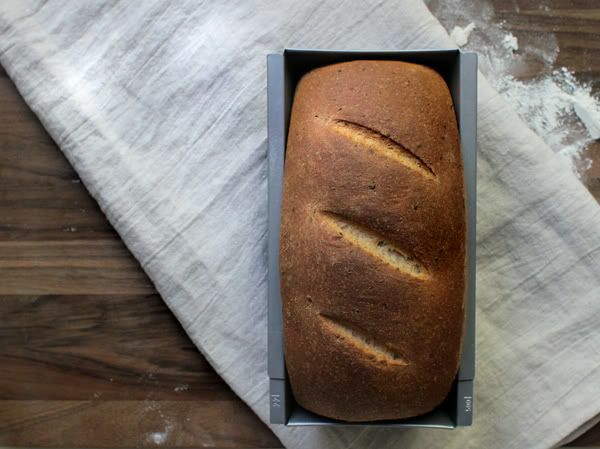 The loaf is hearty and sturdy with a hint of sweetness. It's wonderful. Thank you Betty for sharing your recipe! 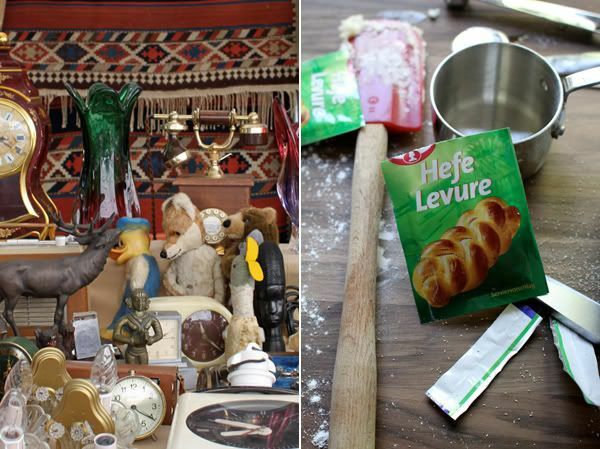 I paired the bread photos with some photos I took this past weekend at the flea market in Bürkliplatz. Zach and I joke that if you are looking for a keyboard from 1993 or a first generation cell phone then this market is for you. As with any flea market there is some good mixed in with the bad, you just have to hunt for it, evidenced by the fact that Zach walked away with a bike! A blue frame with white curved handlebars and a nice little bell! Now I'm jealous. In case you live in Switzerland and have no idea what a packet of yeast (Hefe) looks like (the one above was purchased at Coop) or what the translation of cottage cheese is in german (Hüttenkäse), hopefully the above pictures will give you a little guidance. I should mention that I am not a cottage cheese fan. Actually I've never tried it, but I just know I won't like it. You shouldn't be able to eat cheese with a spoon out of a yogurt container. 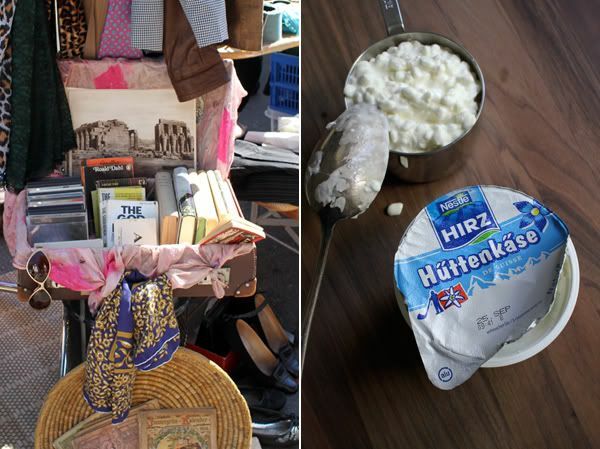 If you have a cottage cheese phobia, don't worry, you won't even know it's there. It just helps provide some moisture and density to the dough. The bread goes through two rising periods, where it doubles in size each time. My apartment is running on the chilly side these days so I turned on the oven and put the bowl on the shelf above it so it would receive some ambient heat and rise faster. This is the dough after the second rise, ready to be scored and placed in the oven. Poor bread has had a rough go of it since the early twentieth century. First it's inundated with preservatives, pre-sliced and stuffed into slick plastic bags and shoved on the supermarket shelves where it seemingly stays fresh until purchased and fresh for a week on the kitchen counter. 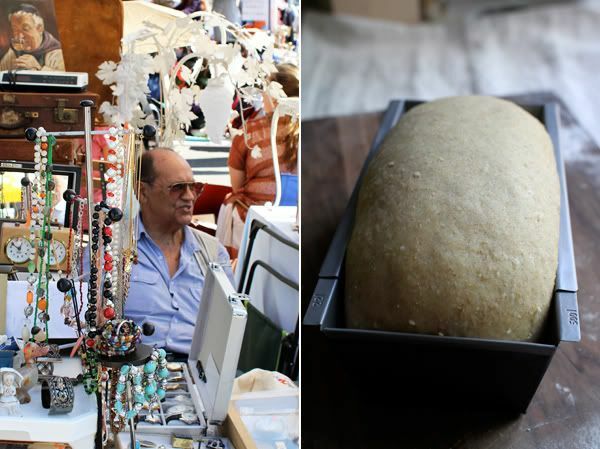 And then, just as the local-preservative-free-organic market starts up, promising a rise in fresh bread, Dr. Atkins comes along and puts it on the 'Do Not Eat' list. Oy. 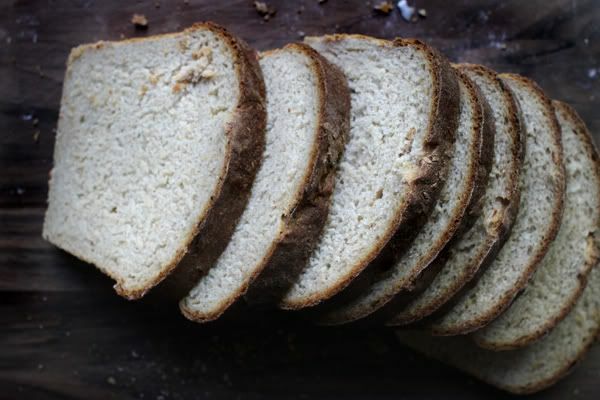 If only Atkins had rallied again sliced bread, because 'sliced bread' is not the best thing (actually there was a ban on pre-sliced bread during World War II, imposed to help conserve plastic as well as to counteract a rise in bread prices). Bread should be bought whole, sliced at home, and eaten that day. It is an of-the-moment food. If you buy it today, it should be stale in two days, if not tomorrow, and if it's not, well, then you should be concerned. 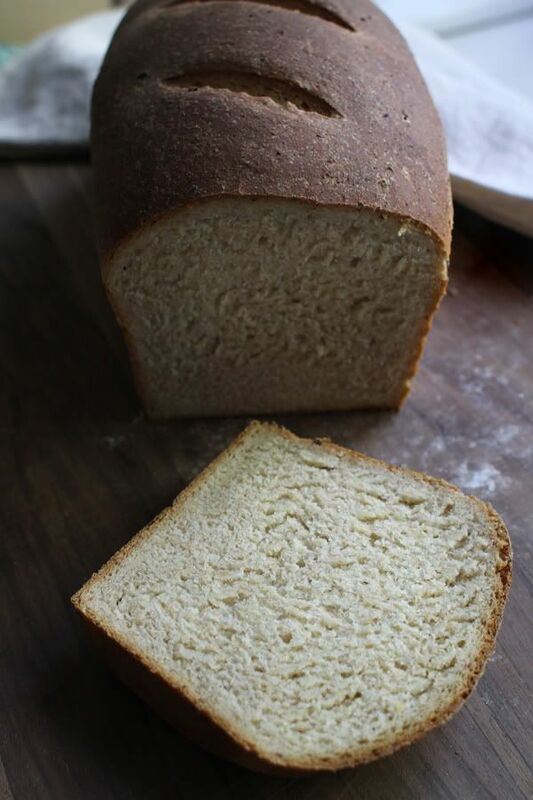 Since this recipe makes two loaves, I sliced one and put it in the freezer. Heat the first four ingredients (water, c.cheese, honey, butter) until very warm, either in the microwave for 1 1/2 minutes or in a saucepan on the stovetop. Pour the liquid in to a large bowl, or the bowl of your standing mixer fitted with the dough hook, add 2 cups of white flour and beat until flour is incorporated. Add the sugar, salt, yeast and slowly add in the rest of the flour and the egg. 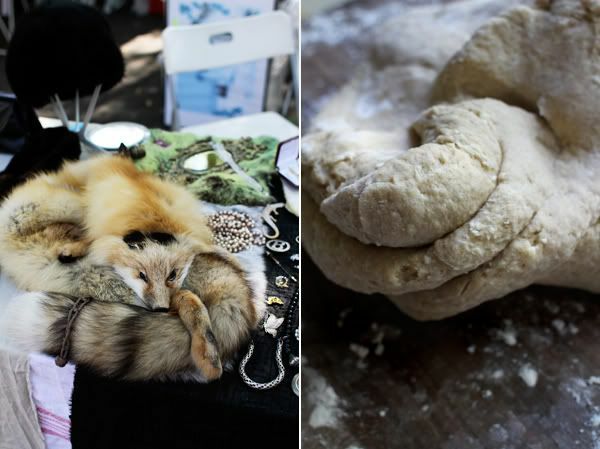 You might not be able to get all of the white flour in, you just want to be sure you have a stiff dough. 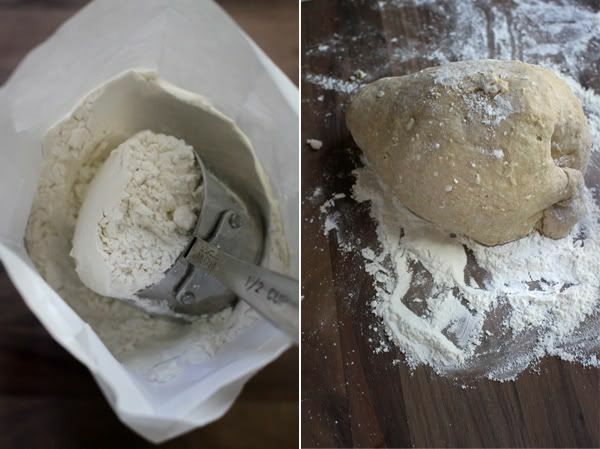 Knead the dough on a well floured surface for 2 minutes or more. Place the dough in a butter-greased bowl. 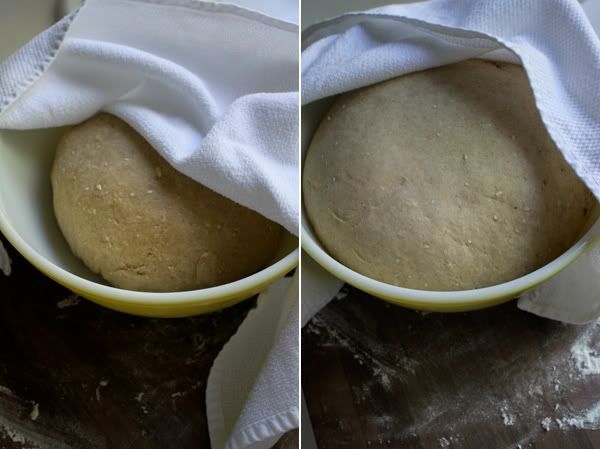 Cover the bowl and let the dough rise in a warm place for about an hour, or until it doubles in size. Butter-grease two 9"x5" or 8" x 4" loaf pans. After the first rise take the dough out of the bowl, punch down and shape into two loaves and place in the greased loaf pan. Let the dough rise for another hour. Preheat the oven to 350º/179ºC and bake for about 45 minutes. Remove from pan and let the bread cool slightly before slicing and devouring. There's Zach on his new bike. I'm in the market for one too, but I'm not quite sure where to look. Zürich folks, do you have any suggestions? I'd like a cruiser bike with a basket, preferably used (read: cheap). Every since I woke up on Sunday with a slight white-wine headache and a belly full of greasy potato chips I've been craving a bagel with cream cheese, my go-to Sunday indulgence. Since bagels, the real New York ones, are hard to come by here, and because it takes a lot of planning to make your own, I decided to spread cream cheese on a slice of this warm bread. And then I added some raspberry jam, just for fun. In the picture on the right I'm helping myself to another little sliver, which inevitably became an entire second slice. Talley! Cottage cheese in bread? I am curious - I'll be making this ASAP! Lovely post. I, too, want a bike with a basket. Kerry! CANNOT WAIT. what do you want to eat? Perhaps if I make reaaaaalllly yummy stuff you won't leave. I cook, we eat, then we both write. You certainly can't write on an empty stomach. Sorry Al, kerry is my roommate nooow! The photos,presentations and recipe are all wonderful.Marvelous! 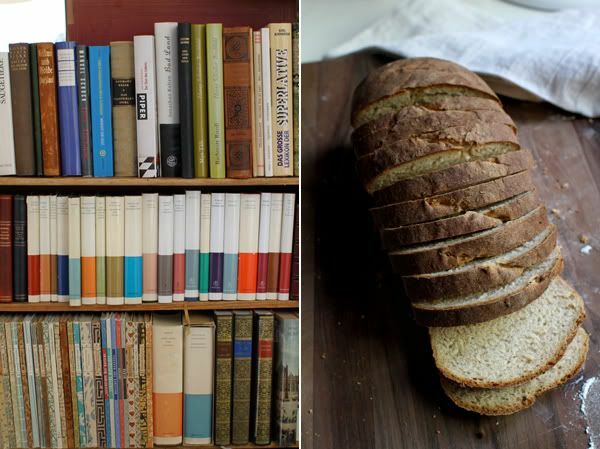 I can almost smell it, fresh bread, whole wheat, healthy, I'm dreaming of having a sandwich right now. Talley, this is awesome! Katie used to share Betty's bread with me when we were roommies. Your blog is so beautiful! 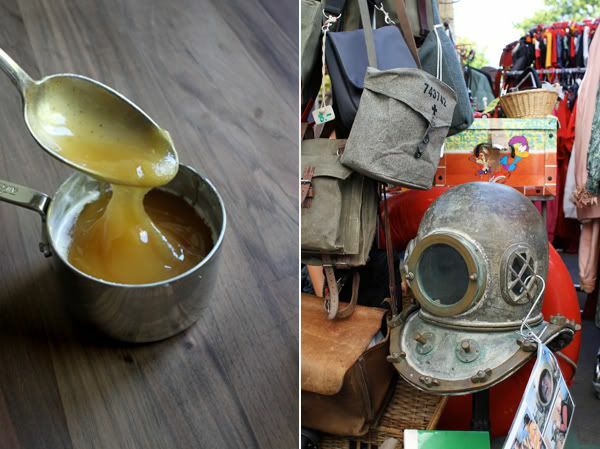 Tres Delicious - thanks for your comment, it was a fun post to put together...and eat! Madison Chloe -Fresh bread is just the best, and it really has a lot to do with the smell wafting out of the oven. Heavenly. 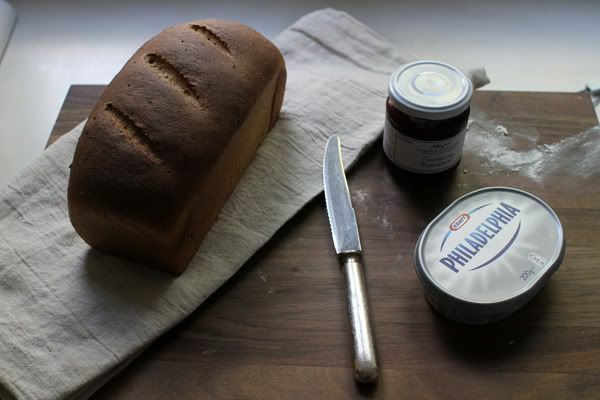 And it really is the perfect Sandwich bread. Kirsten - Hiiiiii! Aren't Katie and Betty just the best! So glad you read this post, and I hope you keep reading. I know from Katie that you are a big time cook. Let me know if you make anything yummy as I love to hear about new recipes. Hope all is well!..Jess says Hi. Your comment came in just as I was sitting down with her for a glass of wine. This is a gorgeous looking loaf. 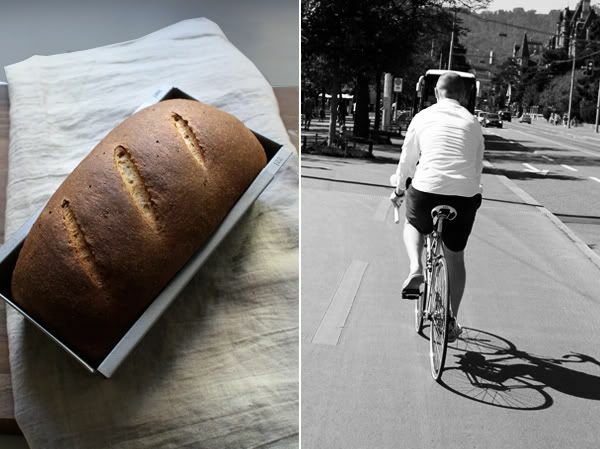 Love your photos .. bread, books and bike? Yes please! The satisfaction of baking your own bread, and subsequently tearing into a piece hot from the oven, is something I'm constantly explaining to others who gasp in disbelief that I bake all of our bread. I'm still a little saddened every time I have to explain all that, b/c if they tried it they'd know exactly why I did it, but to each his own. Some people are not bakers, and I completely understand. This looks like a fine loaf; especially excited about the addition of protein to amp up the nutrition quality. Once I get my loaf pans out of storage, and our home is finished being built, this will be the first thing baked. 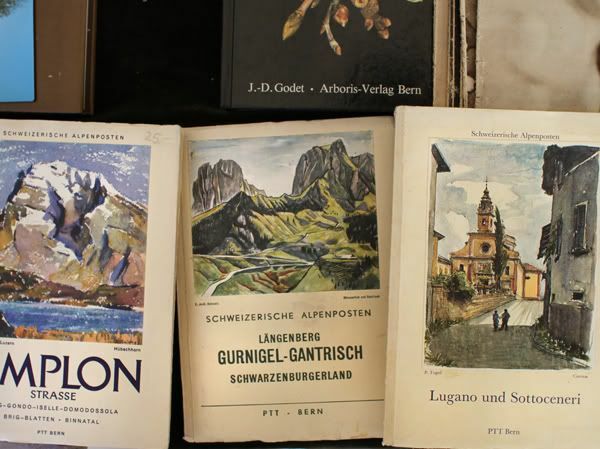 It'll be a nice reminder of my time, albeit ridiculously brief, visiting Switzerland! Holy McMoly, that is an immaculate loaf. I'm forced to try this myself. Sneh - thanks for visiting and commenting! 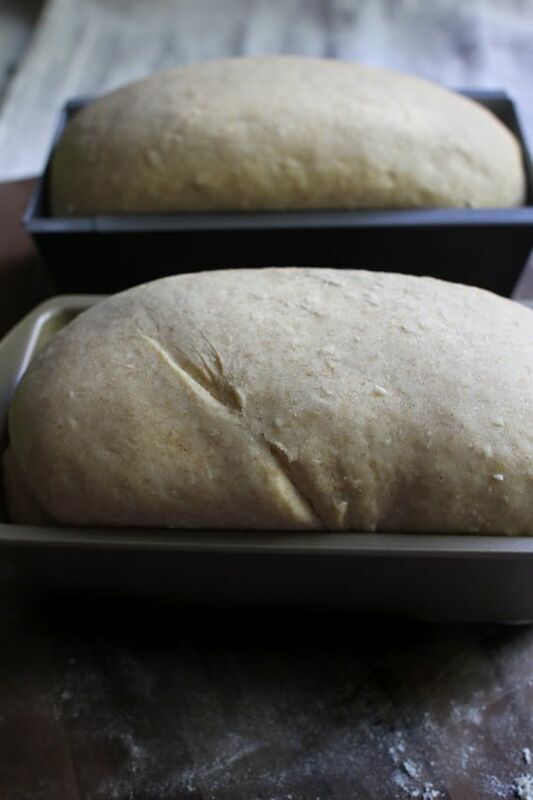 I think I'm going to need to bake another loaf just so I can wrap it in a kitchen towel, place it my bike basket with a good book and head to the park...where I can eat and read. Heather - It's funny isn't it, people's reactions to baking bread. I've come to love it, but it is really hard to explain it to people. I think they just have to see for themselves. A new house! how exciting. Good luck with everything. I'll be baking your New York City Deli Rye soon, that loaf looks amazing. I grew up on rye toast too, my dad loves it! 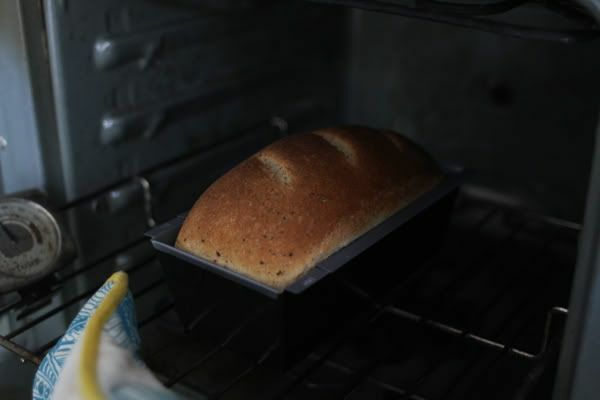 I love to bake bread, it's so relaxing, well at least to me. --Used a bread machine to do all the dough work, which necessitated making the full liquid portion (with the egg added after cooling), and using half of it (which came out to just under 1.75c for each loaf), warming it gently before baking. I saved the rest for the next loaf. --I never have cottage cheese, so I used Greek yogurt (traditional style, plain). I whisked everything in the saucepan very well to make it smooth. --I left out the sugar entirely. --I guessed at the white flour, adding only two cups. I think I'll add a bit more next time, as it seems a bit sticky. 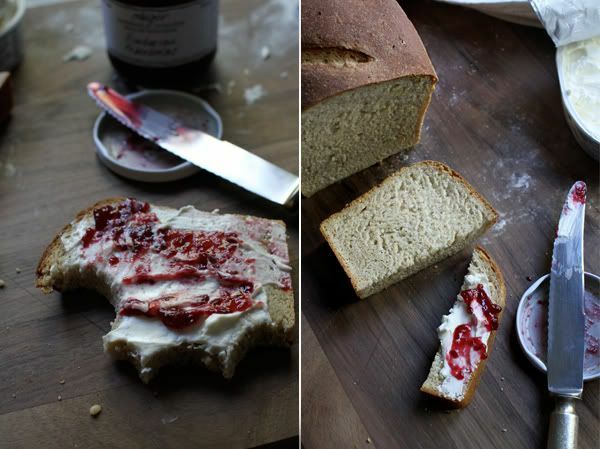 I can't wait to make this my go to sandwich bread!